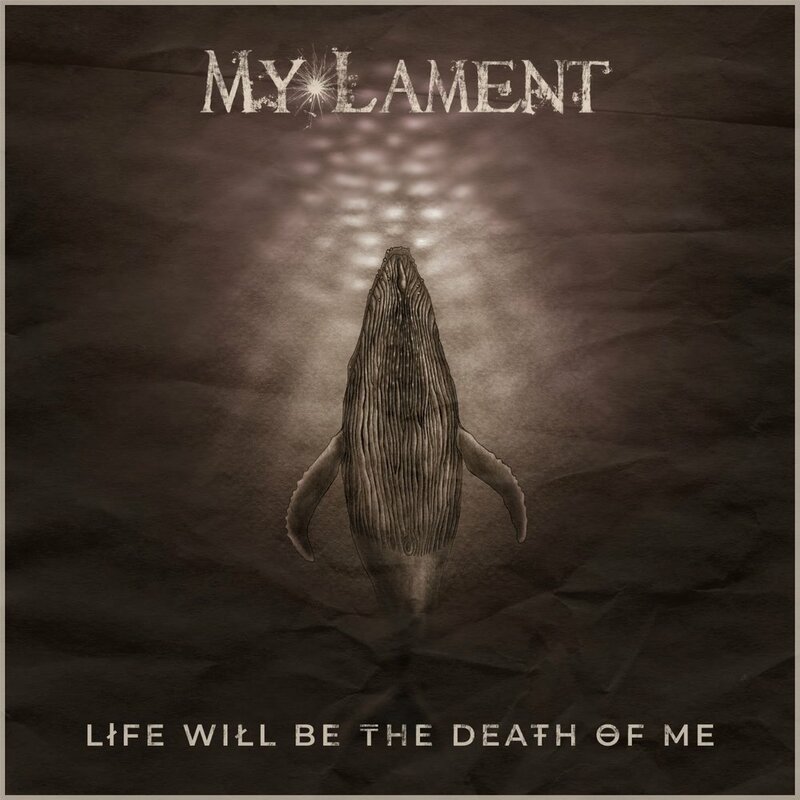 A while ago, I was asked to make artwork for the new single of the belgian doom-metalband My Lament. Now, when you take a look at my illustrations, you wouldn't really think of doom metal, and neither would I, actually. But, knowing that this band isn't really your typical doom-metalband, and that they prefer a more poetical approach for their CD-covers, I really liked the challenge and accepted. Here you can see the finished cover. I will shed some light on how it came about below. When they told me the title of their new single was 'Life will be the Death of Me', several things came to my mind. One of the images I thought of, was the cover of their CD 'Broken Leaf', which consisted of a beautiful photo of a leaf skeleton in fragile hues of grey. I somehow wanted to translate this image into new artwork that conveyed the same feeling. After some silent thinking and collective brainstorming, I came up with the idea of combining the subtle lines of a leaf skeleton with the solid shape of an animal, as if it was dissolving in full motion. A humpback whale embodied this feeling, in my opinion. Looking at pictures of these epic animals always envokes strong feelings in me: on one hand, their size and the vast expanse of ancient darkness they live in scares me, and yet, looking at these massive animals has a tragic quality too; like watching the light of a star that is already extinct. They possess just the right combination of strenght and vulnerability. I didn't have to think long about the technique I wanted to use as a base: black ink it would be. The dark sea just screamed for black ink, dying out on wet paper. And so I started sketching. I experimented with black and red ink to make structures and backgrounds for the humpback whale. 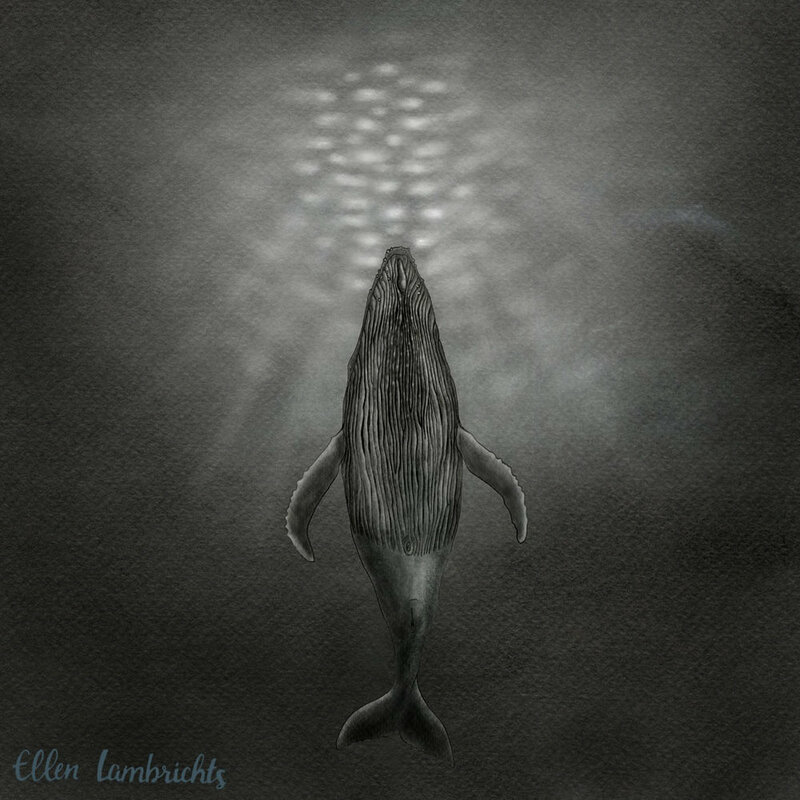 I sketched a lot of whales, to see what movement and shape would fit the image best, and would invoke the right feeling. Shapes and movement, as well as color, all work together in invoking a certain feeling, after all. It's a bit like body language: subtle things can have a big impact. I decided on a couple of poses, and turned those sketches into cleaner ink linework illustrations. The next step was scanning all these elements. 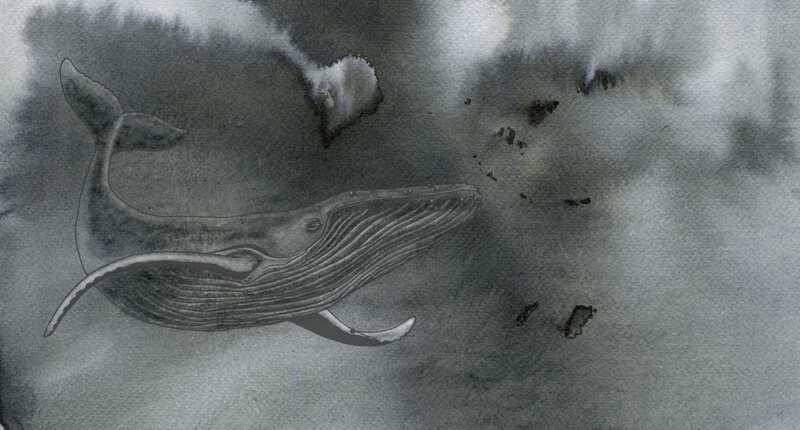 I chose the ink backgrounds with the nicest texture to use as base color for the whales and the linework, after which I started adding shadows and highlights and pulling the different elements together. While working on my initial idea of the humpback whale that was gradually dissolved into a leaf skeleton, I loved the image itself, but I felt that this was a too literal approach to the title; too much like an illustration, if you get what I mean. After discussing this with the band, we agreed to leave out the leaf skeleton and to focus on the humpback whale instead. So I continued working on this until I had two images that clicked and had just the right ratio of darkness and light. Above and below you can see the two final pieces. Sep 16, 2018 finalist of the KeyColours competition!